argh.... today is Saturday, and tomorrow is Sunday. i was holding my tears for the whole week. i just... i miss them. i miss DB5K. and i just bought a DVD of them that i've searched for it for a very long time now. i thought that it will be not available anymore now. i don't know how long i can hold my feelings anymore. it's been a very long time now since the lawsuit case. 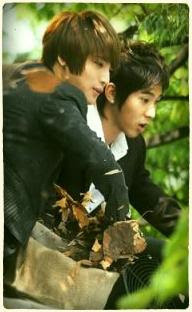 and there's so many rumors regarding YunJae that i don't know whether it's true or not. I TOTALLY HOPE THAT IT WAS TRUE! and recently, i read about HoMin's interview on An An Magazine. they're asked about their future activities, and started to picture each other in 10 years..
"Changmin will have married, and said “He will be a big star outside the house but a strict teacher-like dad at home”"
why did i said that? it's because, before this, Yunho said that he probably will get married when he was 27, then he change it to 30, but then now, he said that he don't even sure about getting married in another 10 years. that's weird isn't it?? ?